The first Thursday of each December is a time of great excitement on the Krakow’s Main Square (Rynek Główny) known for its lively street life and architectural treasures including the Cloth Hall (Sukiennice) and St. Mary’s Basilica (Kościół Mariacki). From the early hours of the morning, crowds gather around the Adam Mickiewicz monument (Pomnik Adama Mickiewicza) to marvel at the new crop of colorful Krakovian szopkas (szopki krakowskie) arriving for the annual competition. After the noon Trumpet Call (Hejnał Mariacki) from St. Mary’s Basilica tower, participants of a cheerful parade fronted by folk musicians circle the square and carry them to the Krzysztofory Palace (Pałac pod Krzysztofory), where judges select the winners. In Polish, the word “szopka” (plural “szopki“) refers to the nativity scenes (szopki bożonarodzeniowe) that adorn every Polish church at Christmas time. Called also mangers, cribs or crèches, they became popular after St. Francis of Assisi created the first manger in Greccio, Italy (1223) and Franciscans brought the idea to Poland just a few years later. The Krakovian szopka emerged from this tradition in the early XIX century due to winter shortages of jobs for stone masons, brick-layers, tilers and carpenters. To make money during the seasonal slowdown, the industrious construction workers began to create the miniature copies of the church mangers used to carry them along as portable backdrops for kolędowanie (a custom involving groups of door-to-door carollers collecting donations for their singing in ritual costumes) or staging the nativity plays (called jasełka in Polish) on the streets or in the houses of wealthier folks. These spectacles starred amateur actors and/or puppets, both gradually replaced with doll-like figurines populating the crèches. That’s how a new form of folk art was born taking life on its own outside of the church setting. Fierce competition among the craftsmen helped to shape the unique characteristics of the Krakovian szopka. 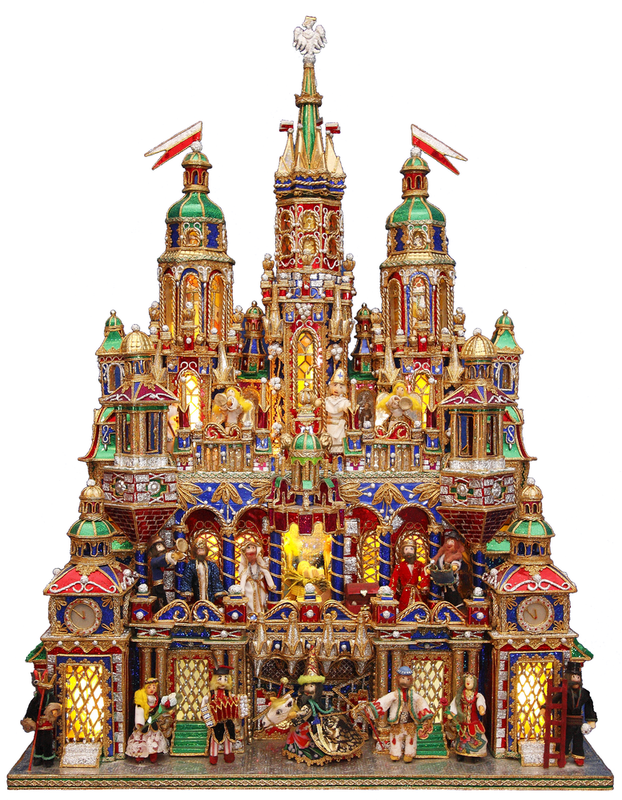 To attract attention of spectators and potential hirers, the szopka makers were forced to innovate – and they did so by turning to flashy materials as well as incorporating the elements of Kraków’s architecture and/or reflections of its legends, history and political/social life. In what became the most distinctive trait, the Kraków crèche took a shape of an urban structure fusing elements of some of the city’s most famous buildings (e.g. the Wawel Castle, Sigismund’s Chapel, Sukiennice, the Barbican, or St. Florian Gate) crowned with the Town Hall Tower or towers of St. Mary’s Basilica and other churches. They also became exquisitely ornate and sparklingly colorful – the effect achieved with the extensive use of cellophane, tinfoil, tissue paper, beads and small pieces of plastic or glass. The range of characters populating the Kraków szopka also goes far beyond that seen in the traditional nativity scenes (the Holy Family, the Three Kings, angels, shepherds and animals). The most common additions are folks in regional costumes (mostly from Kraków and Podhale) and heroes of local legends (the Dragon of Wawel, the Kraków trumpeter, Lajkonik or the sorcerer Pan Twardowski). But some crèches spotlight historical figures (like Tadeusz Kościuszko, the Polish and American hero who famously took his oath on the Krakow’s Old Town Square in 1794) as well as contemporary politicians, clergymen, artists and sportsmen. Szopka craftsmen also make references to current global or local events such as Poland’s accession to the European Union, the World Youth Day 2016, or expansion of paid parking zones in the city. The first edition of the tournament was organized in 1937 to reignite interest in the tradition that weakened during the World War I and fire up the competitive spirit among the szopka makers. Since then the contest was held every year (with a five year pause during the World War II) and winners of its 75th edition were announced on December 10, 2017. As it recently became a custom, all of the 171 entries submitted this year will remain on display in the post-competition exhibit till the end of February 2018. Some winners will also join the already substantial szopka collection of the Historical Museum of the City of Kraków (Muzeum Historyczne Miasta Krakowa), the main organizer and promoter of the competition. The collection is the largest in Poland (about 300 items) and can be viewed all year round in the Krzysztofory Palace located on the Main Square. In addition to becoming a permanent fixture in Kraków’s Christmas tradition, the phenomenon of Kraków szopka occupies also a bright spot in the cultural landscape of Poland. By blending the history, legend and modernity with the powers of imagination and freedom of expression, it is a unique form of folk art with the engaging message and artistic authenticity. In recognition of these qualities, Szopka Krakowska was placed in 2014 on the National Intangible Cultural Heritage List. In March 2017, Polish government filed a petition to include it also on the UNESCO’s List of Intangible Cultural Heritage of Humanity. The decision is expected in December 2018. When approved, Szopka Krakowska will become the first entry from Poland on the list that currently features 429 culture elements from all over the world.